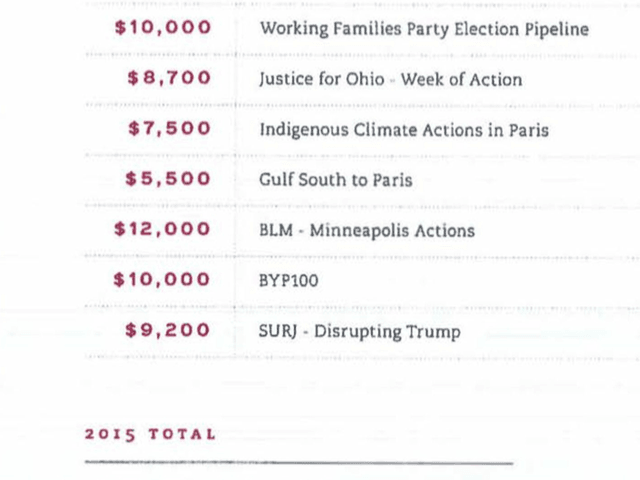 The Democracy Alliance, a George Soros-backed umbrella group of wealthy left-wing political donors, paid activists to disrupt at least one event for Republican presidential nominee Donald Trump, according to a document from the group’s conference in Santa Monica in April 2016. It is unclear whether the $9,200 was meant to cover one disruption, or several. The Facebook page for SURJ includes a profile photo exhorting visitors to “SHOW UP AGAINST WHITE TERROR” (original emphasis), and also includes two videos of protest actions in New York. The first video is a local news story from December 2015 reporting that activists had defaced the statue of Christopher Columbus in Manhattan’s Columbus Circle to protest against Donald Trump. The second video is a self-produced documentary about a protest against Trump at a Republican event in New York in April 2016. The link for that video is either disabled or has been made inaccessible to the public. Video and photos of the event survive on Twitter, however (language warning). The revelation about Soros’s link to the disruptions comes after conservative filmmaker James O’Keefe and his Project Veritas exposed an effort by Democrats to incite violence at Trump rallies and other Republican events for more than a year. The effort centered around a consulting firm called Democracy Partners, with deep ties to the Hillary Clinton campaign and to the White House. Since the story broke Monday, Democracy Partners consultant Scott Foval has been fired, and the group’s co-founder, Robert Creamer, has been forced to resign. The Washington Free Beacon, which first exposed the inner workings of the Democracy Alliance, describes it as a “secretive dark money group backed by George Soros and other liberal mega-donors.” In addition to Soros, major participants include mega-donors such as Tom Steyer, the financier-turned-climate activist who is entertaining a run for California governor in 2018.